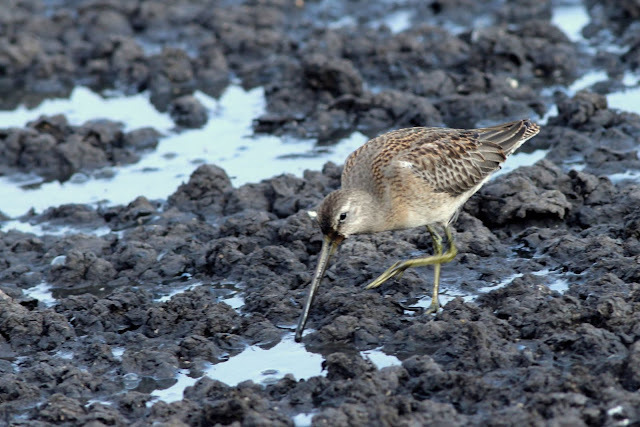 The rare bird alert reported that a Sharp-tailed Sandpiper had been seen the day before in the settling ponds at Iona Regional Park in Richmond. I'd had this bird on my target list for a few years but had never had the luck to see one. Could I get two lifers in one week? The big problem with seeing a Sharp-tailed is that it is very similar to the common Pectoral Sandpiper and the strays tend to associate with the Pectorals. I arrived quite early and started checking out the birds on my way in and saw a group of pectorals almost immediately. I took some shots for reference. 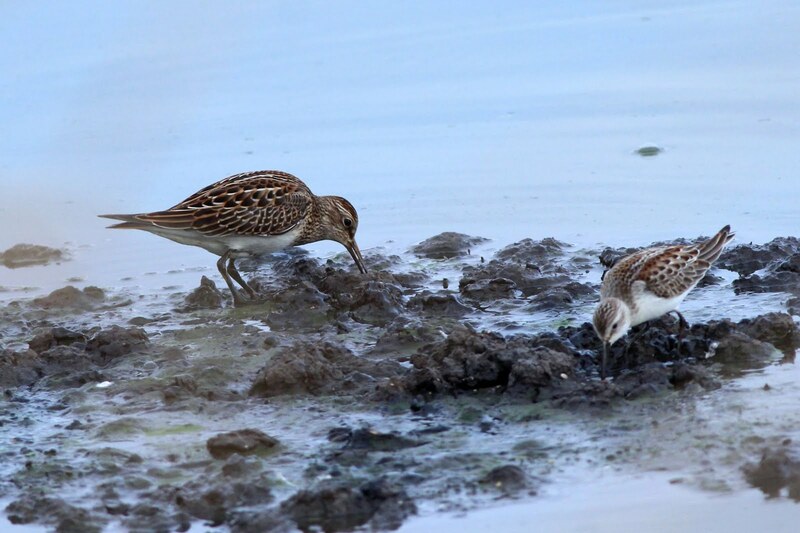 This one turned out quite well and shows a Pectoral on the left and a smaller Western Sandpiper on the right. I made my way around to the Northeast Settling pond where the Sharp-tailed had been seen the day before. There were quite a few birders around, most of them like me looking to see the bird for the first time. A group of birds landed in the muck behind us, they were all Long-billed Dowitchers. As we were scanning the flocks the resident Peregrine Falcon flew over and scattered all the shorebirds and ducks. We'd have to start over. As it turned out, the Peregrine did us a favour. 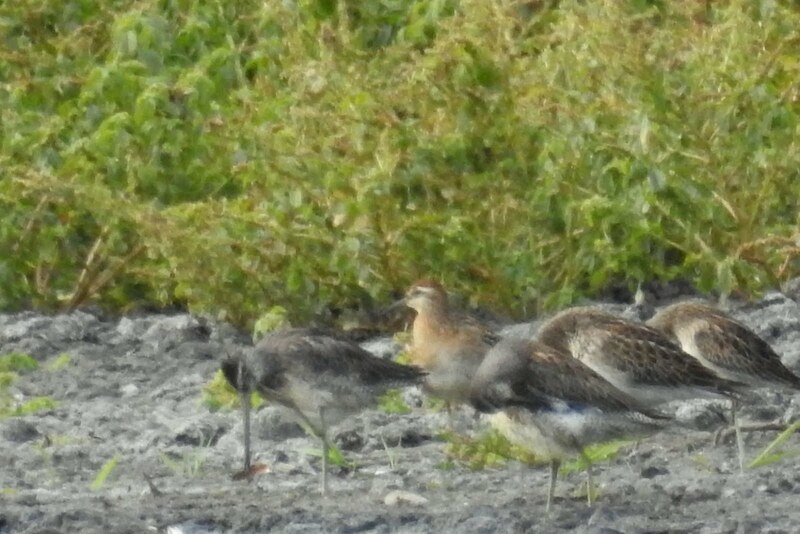 Most of the shorebirds moved to the Southeast pond along the shoreline. One lady thought she saw something a bit different and we were able to locate the bird in our scopes. We confirmed it had to be the Sharp-tailed as it had a buffy breast and a reddish crest compared to the brownish crest of the Pectoral. However, the bird was partially obscured and I was only able to get one open shot with the Nikon zoomed out to maximum. But it enough to convince me I had my second lifer in a week. Hopefully, I can get a better shot of one sometime in the future. 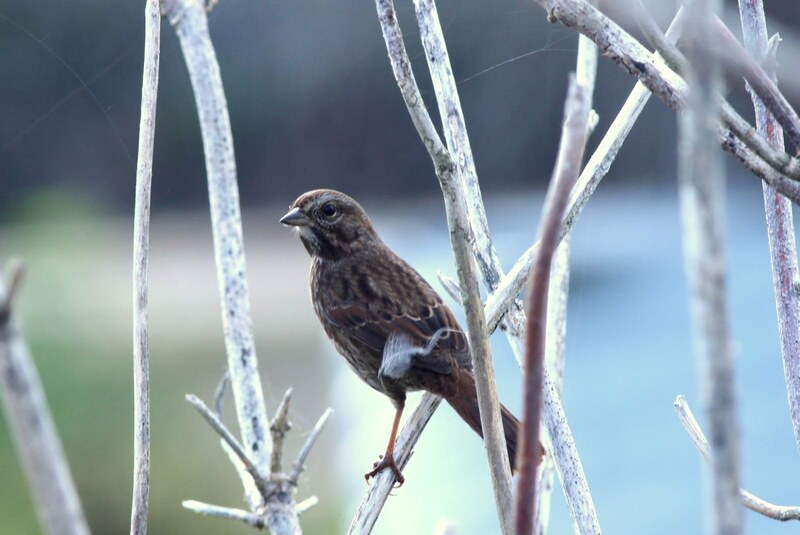 After seeing this bird, I decided I had time to go to Point Roberts where a Lapland Longspur had been seen. 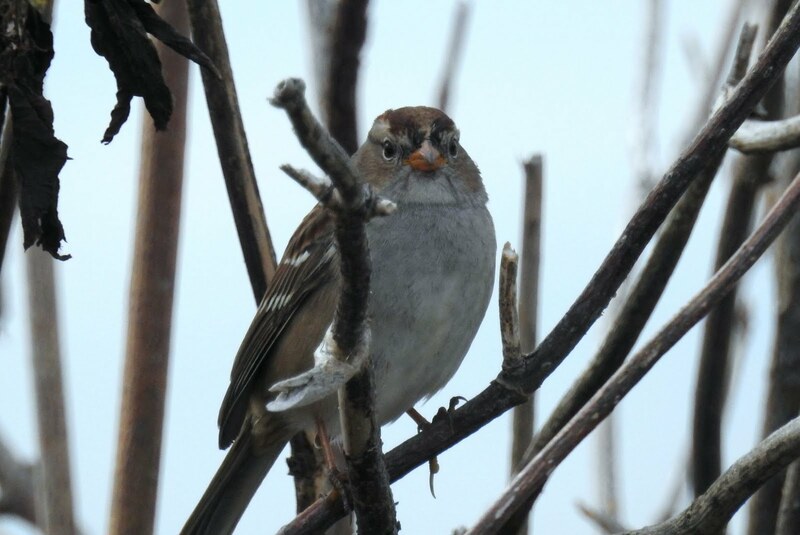 On my way out of Iona, I took photos of a couple of resident sparrows. The first is in Basic (winter) plumage. It's becoming routine to make a short visit here each Sunday for gas and birding. This time I had a target bird to look for. 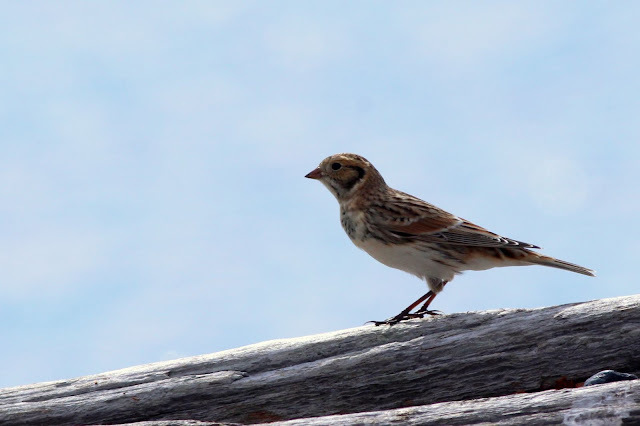 A Lapland Longspur had been seen recently by none other than Chris Charlesworth. I assume he was leading a of Lower Mainland Fall tour. 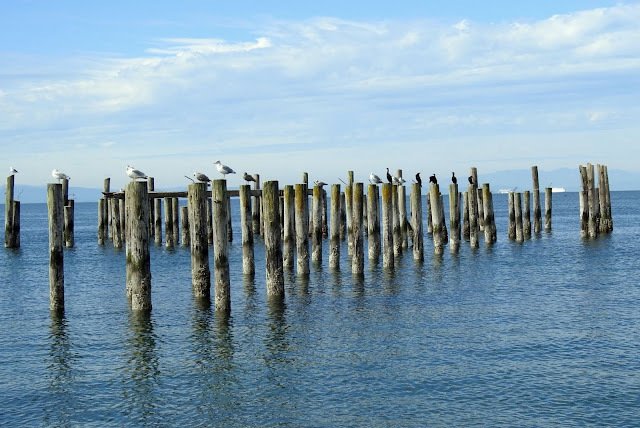 It was a nice sunny day and I tried for an artistic photo of the Cormorant pilings. The Longspur had been seen at the very south-eastern boundary of the park. As I was walking that way I noticed a Northern Harrier in the distance. I can't recall seeing one here before. 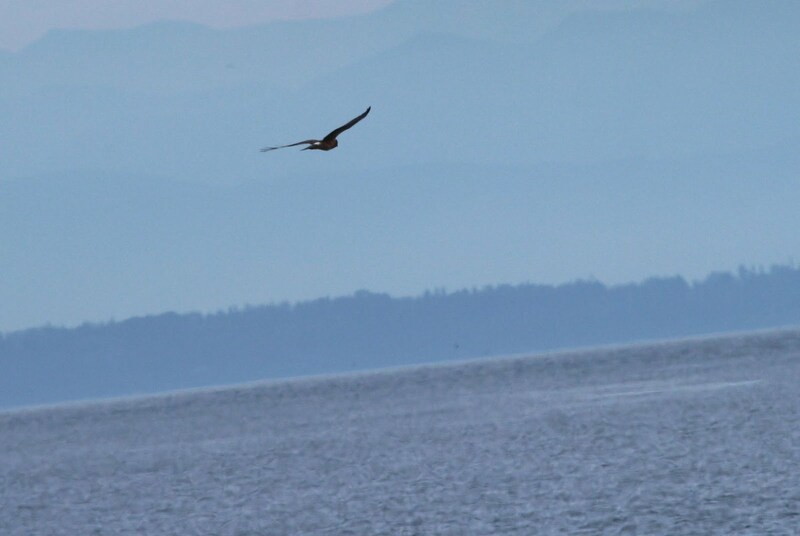 Interestingly, it flew out over the ocean, something else I'd never witnessed. I found my way to the edge of the park but could not locate the Longspur. 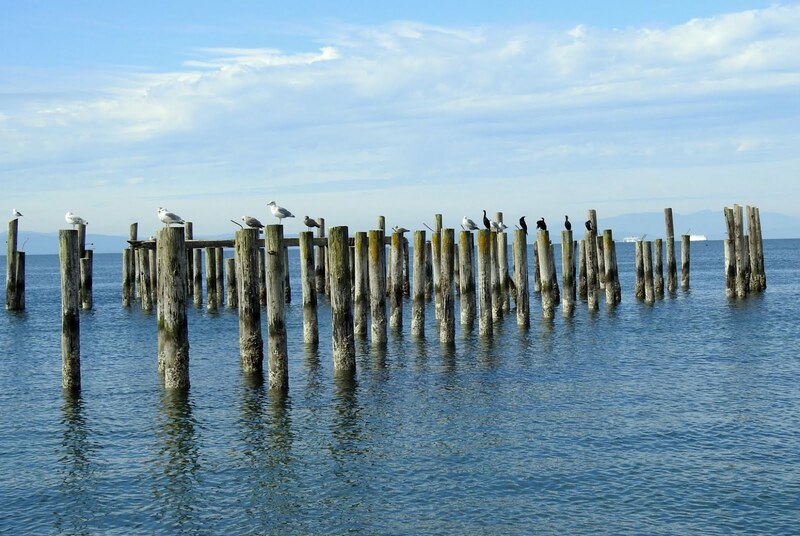 As I headed back, I noticed a small bird in amongst the driftwood on the shore. It was my Longspur! I had seen one at Iona back in April, but only had a fleeting glimpse. This bird was much more cooperative and I took numerous photos. The one below was the best. It had been a busy morning, I made my way back to the car and headed for home.